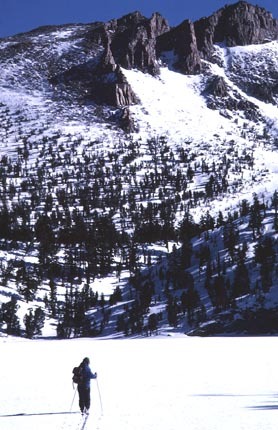 This was a scheduled ski tour that attracted a few skiers. I had been up here once before, so thought I knew the way. I did, but there were problems on this simple lead. Star Lake is considered, by some, an advanced tour. The roadhead is at the end of pavement on the High Meadows Road off the Pioneer Trail in South Lake Tahoe. We parked and skied up the road to the more level area at about 7,000 feet elevation. In the summer, the roads here are confusing and wind about a bit. I knew where to cut off and up, and led in a precise manner to the Lake. We came to the goal of this trip early in the day, and someone took a photo op with my camera, as requested. Hoping for a great powder run down, we headed down, with sparing photos by me. Having been here three times, I was proud of my initial ability to lead to the lake. The last time, in the early 90's, I took some friends and we didn't make it. They never skied with me again. They were better telemarkers, and I had bad problems keeping up with them on the icy road skiing down. They could turn staying on the road, while I went too fast not to run off on the side, where often there was no snow. I hope sometime to re-ski this route and fortify my confidence in my own navigation. A successful completion of this tour is the mark of a true winter navigator.